My husband brought home a red heart-shaped box filled with pretty candies for Valentine's Day. It delighted my sweet tooth. As I bit into the perfect, luscious, caramel, it hit me. Am I living like this box of chocolate . 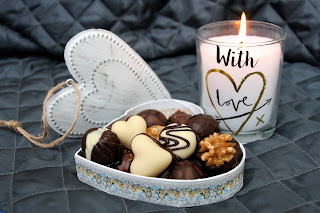 . . always penned in to boundaries, striving for perfection, wanting to look like my neighbor next to me, but being the round, bumpy chocolate piece instead of the smooth, flawless square in their pretty little container? For those of you that are parents or grandparents, we need to enjoy some of the not-so-perfect moments like our kids while they paint or play with sand on a beach vacation. We can't take it too seriously, or the memory-making moments will be lost. Take those chances. As for perfection, no one person is perfect, only our Heavenly Father. He made us as unique individuals. We're not Squares, rectangles, or round, bumpy pieces. I'm going to go grab a piece of that chocolate, the sweetness of life. I hope you do too. Do you think you're living like this box of chocolate? What do you think you can do to change it?